Jones Foster is pleased to announce that three attorneys have been elected for Shareholder and Officer Promotions. 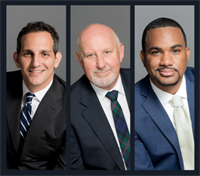 Effective January 1, 2019, Michael Gore was elected as Shareholder, and Thomas Baird and Grasford Smith were elected as Shareholder/Officers. Michael Gore has extensive experience representing clients in the areas of construction, employment, and securities law. Mike develops targeted and practical solutions for his clients. His litigation experience adds an additional element to the guidance he provides in any transactional work; having the benefit of learning certain pitfalls revealed in litigation. Tom Baird is a Florida Bar Board Certified specialist in City, County and Local Government.? Tom’s practice focuses on the representation of municipalities, land use and zoning law, and litigation, including code enforcement, property rights, takings, and constitutional law matters. ?He represents counties, municipalities, and developers in state and federal courts. As a result of representing municipalities since the 1990s, Tom is highly respected by municipal government leaders, particularly in the areas of planning and zoning law. Grasford Smith concentrates his practice on complex commercial litigation, intellectual property litigation, cybersecurity, and transactional matters. He has represented a diverse clientele, including Fortune 500 companies, government agencies, athletic leagues, technology companies, and a United States Congressman, in addition to a variety of small and medium-sized businesses. Grasford approaches dispute resolution as an opportunity to further his clients’ business goals. He develops comprehensive yet practical legal solutions by first understanding his clients’ businesses as opposed to focusing solely on specific legal needs.